RadioFreeLiberal.com • View topic - World Series, last night's remarkable game 5. World Series, last night's remarkable game 5. Post subject: World Series, last night's remarkable game 5. Astros and Dodgers broke the game of baseball into a million pieces. Please note in the author's list of "dumb, awful baseball things" that happened last night, "the strike zone" appears four times. Post subject: Re: World Series, last night's remarkable game 5. I started watching it after the Dodgers had a 4-0 lead and continued until the end. Every time I thought a team went ahead the game was over but then the other team came back and tied the score. I have to say the game was interesting to watch and it was kind of the way I like games to come down to with either team on the edge of victory/defeat. As for the"dumb things" from your link, I did read about the pitchers on both teams complaining about the baseballs feeling different from the ones used during the regular season. They said the baseball coverings were "slick" preventing them from throwing a good slider. However, since both teams had this "problem" it didn't really change the game very much. 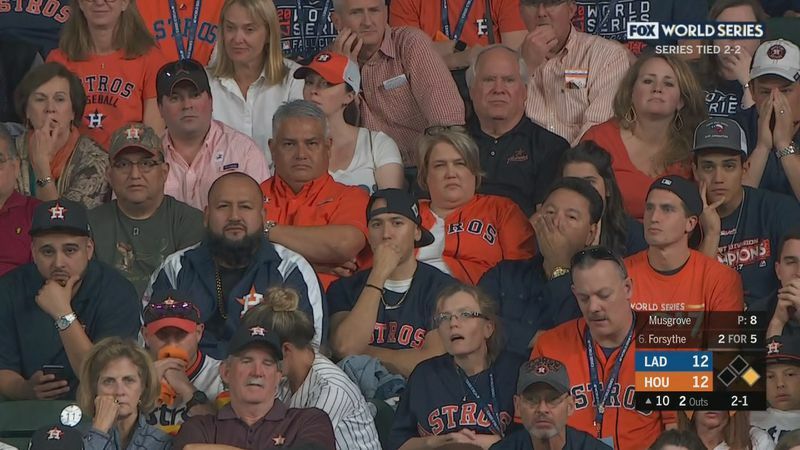 Did you notice the photo in the article of a section of the crowd during the top of the 10th? I think this was right after Puig's home run. Look at 'em...they're like "christ all mighty will this plane ever land???" This "what happened to the strike zone" question is a serious problem. I watched from the 6th on and saw a half-dozen pitches up in the alleged strike zone that were six inches in and called balls...and a half-dozen pitches down that were three inches out and called strikes. It looks to me like the strike zone is over the plate between the belt and the ankles. WTF is that? The players hate this ridiculous inconsistency of the strike zone, both batters and pitchers. I hated it when I pitched in high school and a couple years in a semi-pro league. And the only thing the MLB commissioner and the owners do about it is maintain the rule that if you show you're pissed off about the home plate umpire's pitch calling (batter or pitcher) the incompetent schmuck can just toss you right out of the game. The technology is there to have the pitches read by computer and everybody will know that it's 99% right, instead of 84% right. The home plate umpire can call hit batsmen, foul balls, tags at the plate, interference and all the other stuff they do...and leave the pitch calling to a dependable system. Does anybody, players or fans, really want a five hour baseball game? Not in the east. It ended at 1:30 AM. Oh, OK, that's "only" 12:30 central, where Houston is. Unless it's one of those 18-inning things, that's just too long. I blame the fracking TV. The manager walks out. He changes pitchers. 3-minute commercial break, of the same obnoxious propagandized manipulative brain fryers as last time. We're back. New pitcher throws one ball. Popped up, caught. Inning over, two minutes later. 3-minute commercial break, of the same obnoxious propagandized manipulative brain fryers as last time. That's 6 minutes of commercials for 2 minutes of baseball. Rinse and repeat until the audience falls asleep. I've really had it with this series. I'm especially over T-Mobile and its spending spree on ads. I'm also over this home run derby. I prefer strategy. The ball really does have to be juiced. Players are routinely hitting shots that practically go over the back of the ballpark into the street. Offense is a two walks and a homer. In general, baseball has outlived its welcome this year. i kept checking in to this game and kept saying....get out its only the 5th Still?...then the 6th then the..
was it the longest game Ever? Watched from about the sixth or seventh inning on. Great game to watch (especially when you don't care about which team wins). tho i didnt 'watch' the games i was tuning in to them often each evening. I am mostly indifferent to baseball. Didn't grow up playing baseball and never followed a team. But there isn't much better than game 7 of the World Series and we've had two of 'em in two years. Fantastic stuff.